Emory Cares International Service Day offers dozens of ways to volunteer on campus, in the Atlanta community and around the world. Here, 2016 volunteers help with a planting project with the Office of Sustainability. On Saturday, Nov. 11, hundreds of Emory students, alumni, staff, faculty, family members and friends will join in a day of volunteering in communities around the world. Emory Cares International Service Day is a partnership between the Emory Alumni Association (EAA) and Volunteer Emory, a program housed in Emory Campus Life that seeks to promote social justice through self-examination and service. 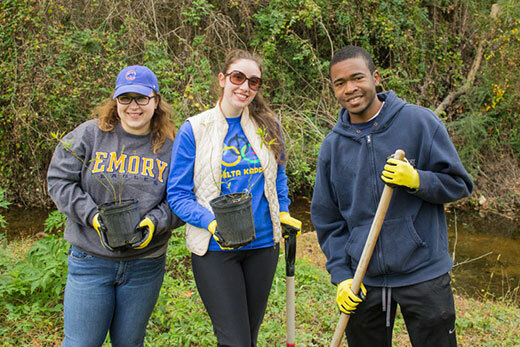 Emory student volunteers will gather at McDonough Field on at 11:30 a.m. on Nov. 11; bagels and coffee will be served, followed by transportation to project sites. All volunteers and project leads will receive Emory Cares T-shirts. Oxford College alumni and students will volunteer for the Newton County Foster Care program by packing toiletries into shoeboxes for Newton County Foster children. Oxford College alumni and students will volunteer to help the Newton County Foster Care program by packing toiletries, school supplies and small gifts into shoeboxes for foster children and youth. Tammy Camfield 89Ox 91C, senior director of alumni relations, brought the day of service to Oxford 13 years ago. This year, volunteers will also make holiday stockings filled with toiletries and gifts for veterans. Amanda Arrendale, Lorri Alston Anderson 97Ox 99C, and sophomore Vidushi Gupta serve as volunteer coordinators. In addition to the foster care support, volunteers with Oxford Athletics and the Center for Healthful Living will help clear Oxford’s Nature Trail in cooperation with Eloise Carter 78G 83G, professor of biology. Like the Oxford project, many local Emory Cares projects will give students and alumni the opportunity to work together, building connections while serving others. Through the EAA's Emory Cares International Service Day website, interested alumni can sign up for 16 trips in the Atlanta area, often combining efforts with students with shared interests, such as the Emory Muslim Alumni and the Muslim Students Association working together at the Wylde Center, or the Emory Alumni Environmental Network, Emory Climate Analysis and Solutions Team, and Greeks Go Green joining forces to work at the Center for Hard to Recycle Materials. Alumni can also sign up through the EAA for dozens of Emory Cares projects happening across the country and around the world. This year, for example, volunteers in New Jersey can join project leaders Jodi Sydell Rosenzweig 80C and Charlie Rosenzweig 80C 80G at the Matheny Medical and Educational Center's "Full Circle" event in Peapack. The annual event showcases art created by artists at Matheny, a hospital and school for children and adults with medically complex developmental disabilities. International projects are happening in Spain, Lebanon, Shanghai and beyond, according to Lizzie Boyer, marketing specialist at EAA. These include Emory alumni, family and friends in Spain gathering to serve breakfast to over 350 homeless people at Comedor Ave Maria in downtown Madrid. Meanwhile, Emory Cares volunteers in Lebanon will work with Ouzville, a project that brings color and street art to the Beirut neighborhoods of Ouzai, Burj Hammoud and Cola. And Emory alumni in Shanghai will volunteer with Shanghai Healing Home, a nonprofit foster home assisting local Chinese Children’s Welfare Institutes by providing pre- and post-surgical care to abandoned babies born with surgically correctable issues. Emory Cares was founded by Renelda Mack 83C, a former Emory Alumni Board president, in 2003 and has become a favorite annual tradition.